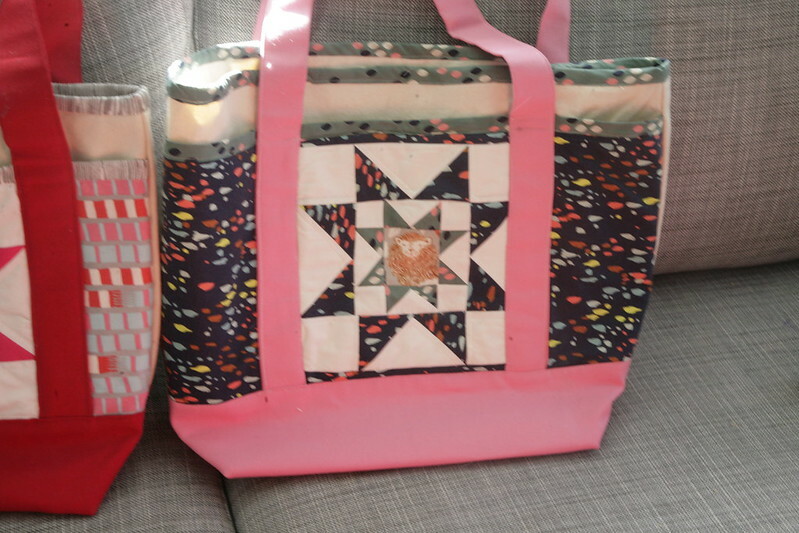 Inder Loves Folk Art: Two Nova Totes and Yet Another Sewing Machine. Here's something you can make entirely on a vintage straight stitch machine while your regular machine is in the shop: ThreeOwls' Nova Tote. These are actually belated Christmas presents. Yeah, yeah, it's the end of February. I'm not great with deadlines, as you know. Better late than never, etc. These were really fun and fast to make, just like my first one. The best part is choosing fabrics for the pieced front. 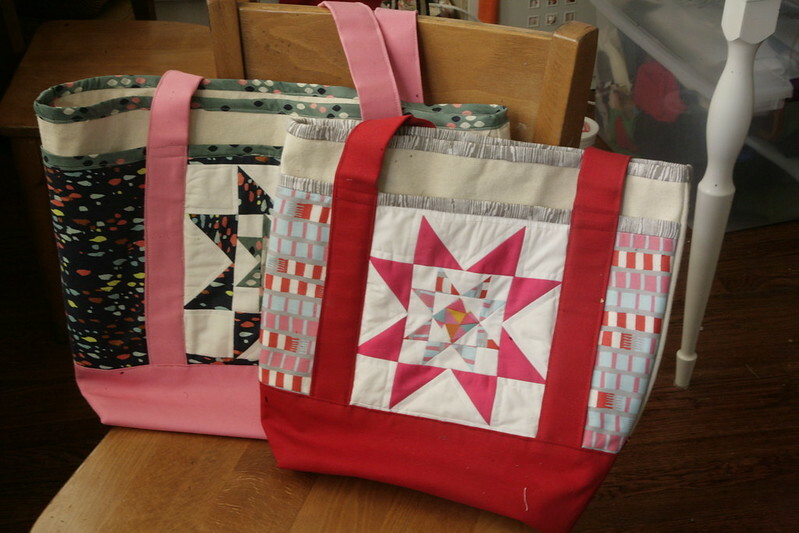 For the one on the right, I made a size "medium" and chose a mix of fabrics with pinks and blues in them to provide a pleasing visual contrast to the red canvas. My favorite part of that one is probably the awesome Dewberry gray woodgrain binding. Faux bois all the things! For some reason I didn't get a great in-focus photo of the second one, but I probably don't have to even mention that I used Sarah Watt's Cotton + Steel fabrics for that one. Y'all knew that. I really love how the darker colors compliment the pink canvas I used for the straps and bottom. 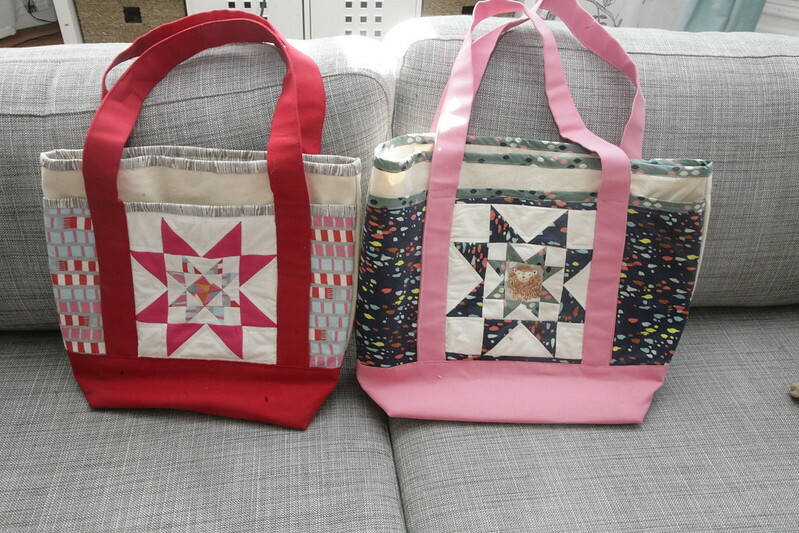 I bound the raw edges with double fold bias tape on both bags. These aren't particularly fancy bags, but I use mine all the time for packing picnics, farmers' market produce, and bringing projects to my occasional ladies crafting parties. 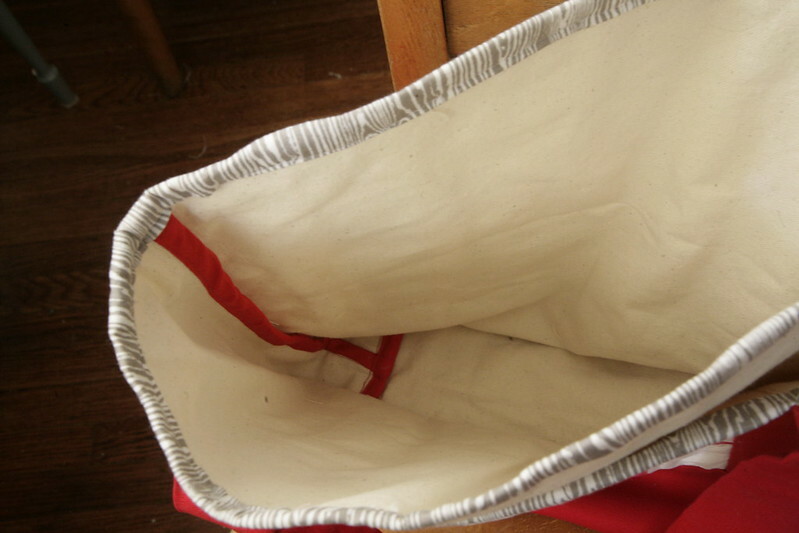 It's a simple and practical tote. In other news, I have a "new" old sewing machine! Remember Mr. Grumpy, my eccentric animal-loving neighborhood sewing machine repair guy? 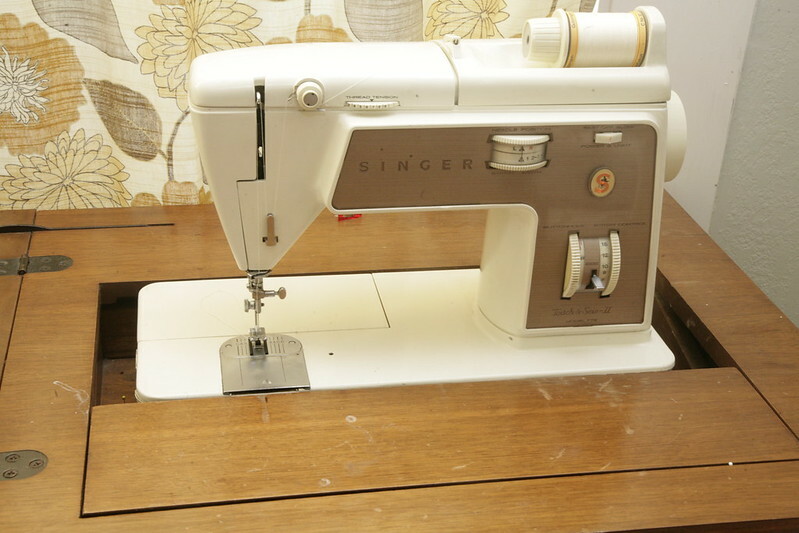 When I dropped of my regular machine for him to look at, I had seen an old 60s Singer taken apart in his workshop and said, "Oh, I learned to sew on a machine just like that!" 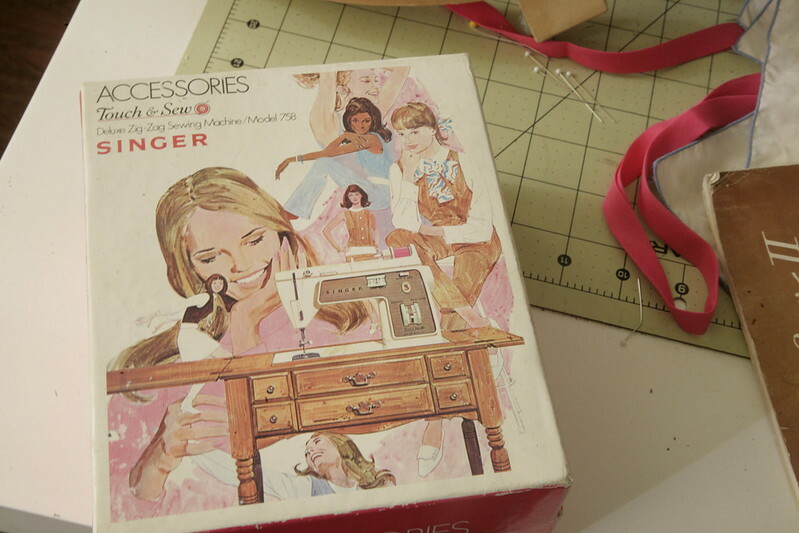 Before my current machine, I sewed on a 70s Singer Stylist for more than a decade. Well, Mr. Grumpy told me that my recent model Singer wasn't worth the money and time it would cost to fix it, what with all of the crappy plastic parts, etc. I was disappointed but I said I understood. I know a lot of sewing machine purists, and I can appreciate that Mr. Grumpy doesn't like working on newer machines. When I went down there to pick up my old machine, I brought my Elna Grasshopper to show him. As I mentioned in my last post, it stitches great but it's a bit sluggish and I have to turn the fly wheel to get it started, so I thought he might be able to get it going a bit faster. Even though he's a Singer guy, I figured that these things are like a VW Bug: anyone who knows about sewing machines should be able to figure out such a basic straight stitch machine. 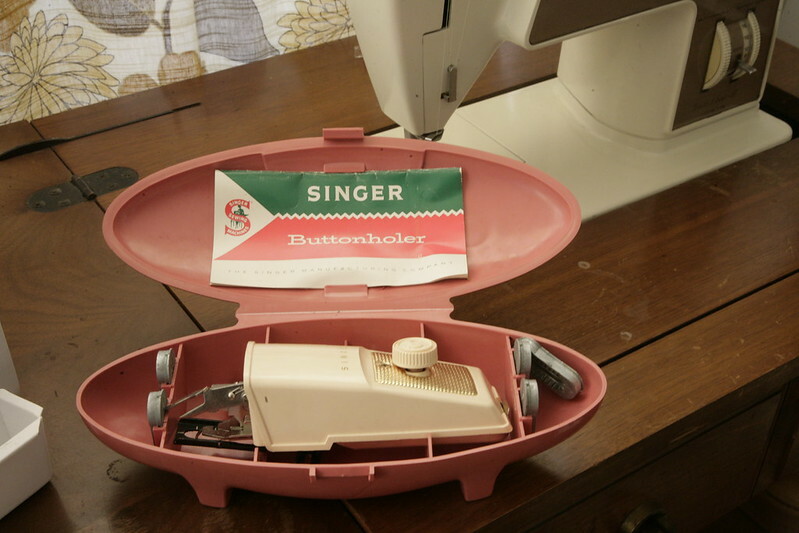 When I got there, Mr. Grumpy (whose name I may have to change one of these days) had pulled out this lovely old Singer "Touch & Sew," complete with its original manual and accessories. He said it had been sitting in his shop for almost a year, and that since it was similar to my first machine and I was comfortable sewing on it, I might be the "perfect owner." And then he offered to sell it to me for a great price considering everything was there and he had already tuned it up and put it in great working order. I'm no fool. I bought the machine and bashfully took it home, where I think my husband rolled his eyes so hard it hurt. It is not exactly the same as my old machine. The bobbins are different, and the bobbin actually winds in the bobbin case! This would be especially convenient for piecing a quilt and other operations where you're likely to need lots of bobbin winding all with one color thread, because you barely have to interrupt your sewing to wind the bobbin (the needle stays threaded during the whole process). That's why this was called the "Touch and Sew." The only down side to this is that I will need to buy some new bobbins for this machine, it does not take regular Singer bobbins. The other "big" difference is that this machine used cams for hem-stitch and other non-basic zig-zag stitches, instead of having a dial on the face of the machine. I'll be honest, I use those stitches so rarely it may be a while before I even try out the cams. 99% of my sewing calls for straight stitch and basic zig zag (varying length and width, of course). It does have a free arm, which comes in handy now in then. And THIS. This was worth the cost of the machine alone in my opinion. These old Singer buttonhole attachments make the best buttonholes, better than anything a modern machine can do in my experience. This is the holy grail of buttonholes, and this particular buttonhole attachment actually looks like it has never been used! What this means is that even though my regular machine is still in the shop, I am back in business for apparel sewing! With a basic zig-zag and buttonholer, there's nothing I can't sew at this point. Wahoo! I'm almost excited to make something with a lot of buttonholes now. That machine sort of reminds me of the one I learned to see on. 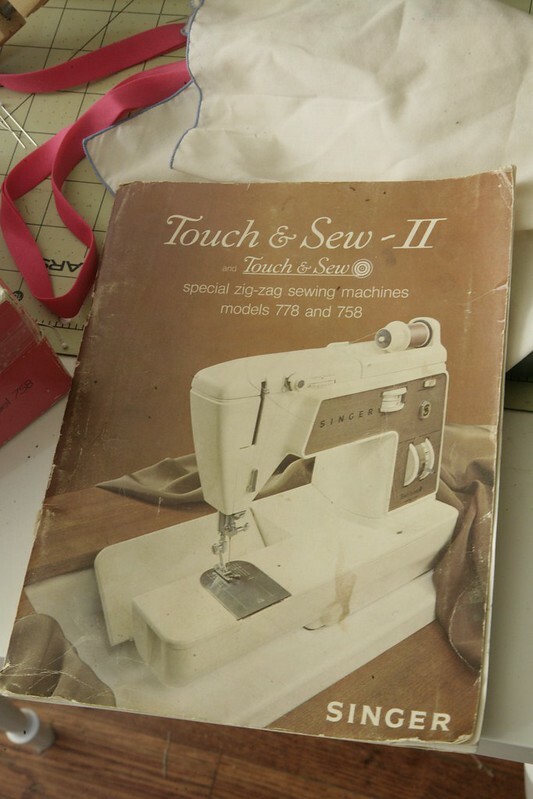 I believe my mom still uses that machine (when she isn't having me do her sewing for her!) Your tote bags are so pretty. I love the pieced panels!! LOVE it! I think this is pretty much the machine my Granny used to sew on, and she made the most awesome stuff, particularly doll and teddy clothes. I would take my toys over there and they would stay a while and next time I visited, they would have a new set of clothes :) Oh and I love the buttonholer. I have the same one except in a green space-age container. And... maybe... another couple of them also.... Nice work, Mr Grumpy! Does it take the thin wide bobbins? I have my mom's old Singer and those are the bobbins it uses - I have a ton of them and don't use that machine because its feed dogs stopped working and I was too poor to get it repaired and someone else gave me a machine to use instead. I can send you some of them. It is amazing how blessing come the most unusual places sometimes! I'd say he likes you! Lucky you! I wish I had a sewing repair person local! I once had to send a machine under warrenty 300 miles to get it cleaned! You can always go online and browse and look at the offer. 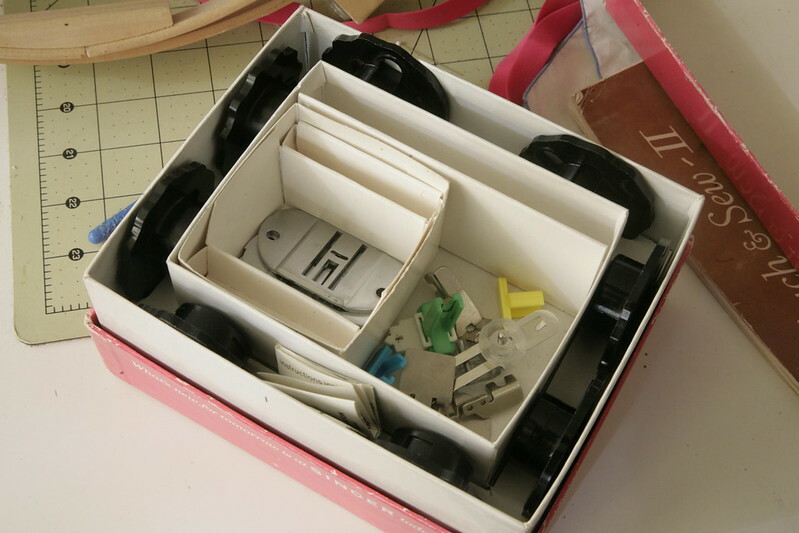 The good thing about that method is that you can quickly compare a lot of sewing machines. You can look at and see many customer testimonials from those people who bought one. You will become skilled and professional by practicing its tools. You have to take dresses and try to sew them to become successful in sewing job. It is amazing how blessing come the most unusual places sometimes! I'd say he likes you! Lucky you!